In 1854 Antoine Théodore FAURE settled in Revin in the French Ardennes. He was the youngest of nine children. His father, Gilbert Faure, was originally a policeman in Peyrat-la-Nonière in the Creuse region. Having received a scholarship at the School of Fine Arts and Crafts in Angers, Antoine Théodore completed his studies with flying colours. He subsequently settled in the Ardennes, where he worked initially as a receptionist at the Compagnie des Chemins des Ardennes, which constructed and maintained the local railway network. Soon, however, he decided to become independent and in 1854 he set up his first factory in Revin where he manufactured moulds for the construction of railway materials. The factory consisted of a rectangular hall, 15 m wide by 60 m long. 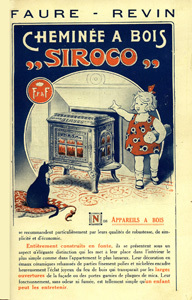 But this type of work did not particularly appeal to him and he decided to start manufacturing 'Faure' stoves. Business was brisk and Antoine Théodore started to build new manufacturing plants. However, before long he faced financial difficulties and he reached an out of court settlement in order to solve them in 1868. Théodore sold his factories and materials but immediately rented the same facilities and continued his activities. He even sold his house to the Morel family, a local competitor. The factory was eventually bought back in 1879 and the house in 1903. This time the business ran smoothly and once Théodore's son, Henri, joined the company developments proceeded at a pace. Henri understood that it was important to be in charge of your own financial affairs, rather than leaving it to others. In 1880 part of the manufacturing operations were moved from Revin to a foundry in Laifour, which was built specifically for that purpose. In 1882 the company bought a factory in La Petite-Commune, where a copper smelting plant was installed. and, during that same year, an iron foundry was built in Signy-le-Petit. In 1891 Henri took charge of the company following the death of Antoine Théodore. He was the one who truly developed the company to 'Faure Père et Fils'. He bought every piece of land he could lay his hands on in order to expand the factory. From 1900 onwards his eldest son, Louis, became his assistant. 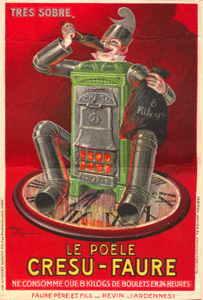 His other sons followed, one by one, Raymond in 1905, Henri in 1914, Pierre in 1921 and Jean in 1923. The factory catalogues at that time included an exceptional range of models, i.e. 40 different cast iron ranges, 34 types of stoves and open fires, 48 larger stoves, 26 types of freestanding stoves, 71 sheet iron and cast iron cooking ranges, 13 different sheet iron and cast iron kitchen stoves and an extensive range of related articles in various sizes - 1400 products in total. 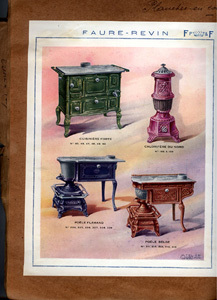 This assortment included an impressive collection of grates, coal buckets, irons, waffle irons, small stoves and warmers, soap trays, spittoons, plate stands, fire dogs, umbrella stands, spades and tongs, plates and other containers, boot scrapers, table and bench legs, vases and flower pot holders, bouquet holders and garden containers, feed troughs, water troughs, urinals, fountains, toilets and water reservoirs, cast iron pumps and the entire range of black or galvanised tin. 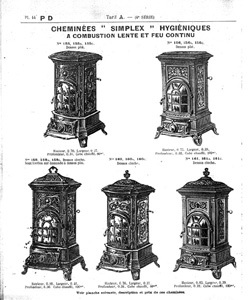 The advent of war meant that all activities in the Ardennes factories came to a halt and Henri decided to continue producing stoves and ranges at two 'emergency' plants located further south in Nevers and Conches. The company's head office was moved to Trouville-sur-Mer, where Henri owned a villa. His four eldest sons had to join the army, but eventually returned in June 1919. 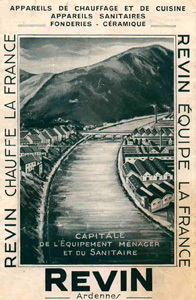 Following Henri's death in 1922, the Faure factory was managed by a Board of Directors chaired by Louis. Again a period of prosperity, characterised by intense activity and large volume production, followed. The way in which the business was run had now changed and in 1925 'FAURE' participated in the Paris Exhibition for the first time. 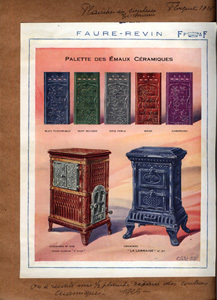 The company also opened a showroom on the boulevard Richard Lenoir in Paris. 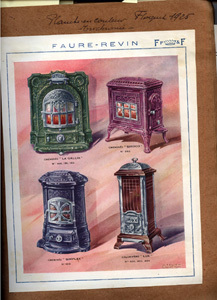 1926 saw the successful launch of the Crésu 572 stove and acquisition of a new factory under the name of 'Cinq Paires in Revin. In 1931 'FAURE' introduced the 'family salary' principle based on the premise that each employee who was head of a family received an extra 20% salary per child, which in effect meant that, with five children, the employee's salary doubled. This benefit was hierarchical or linked to a maximum number of children. In 1934 a new sheet iron and enamelling plant was built and the company decided to participate in the 'Société Nouvelle d'Electricité et de Chauffage' (New Electricity and Heating Society) in order to further diversify its production. The subsequent war and complete evacuation of the Ardennes region marked the end of this period of development and prosperity. 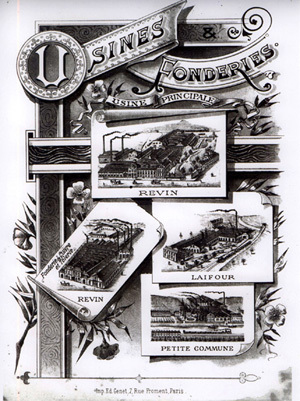 A small section of the Revin workforce started again in Nevers and found work in the factory that had acted as a refuge before in 1914. After the second world war activities did not start again in earnest until 1952. Many problems had been encountered in the period after 1945 and production at the factory in Signy-le Petit did not start until then. War damage had opened up an opportunity to start the factory earlier but the company decided to invest in the iron foundry first because demand had changed. The demand for sheet iron, rather than cast iron, products was rising. 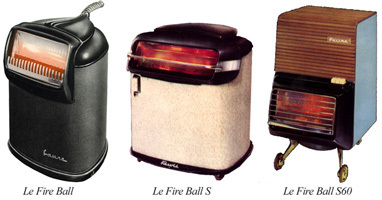 The invention of the 'FIRE BALL', a new type of mobile apparatus that ran on butane, in 1953 was a huge success but not enough to fend off increasing competition in the market, especially from Italy. 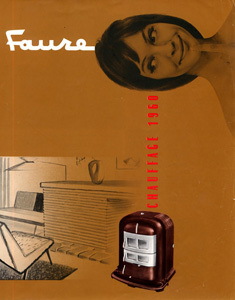 In 1960 'FAURE' was sold to its main competitor in Revin, 'ARTHUR MARTIN'. This manufacturer continued the brand's development and model standardisation. 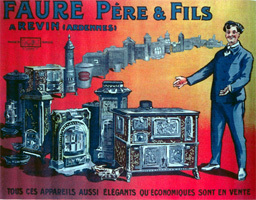 The range of 'FAURE' products being sold noticeably improved, but only the brand label on the equipment still indicated the difference between the two makes. 'ARTHUR MARTIN' faced the same difficulties as 'FAURE' and was taken over in 1972 by the 'Société Générale de Belgique', which in turn sold its interest in the business to 'ELECTROLUX' in 1975. In that sense the 'FAURE' brand still lives on in the electrical domestic equipment sector, with a long historic industrial past.